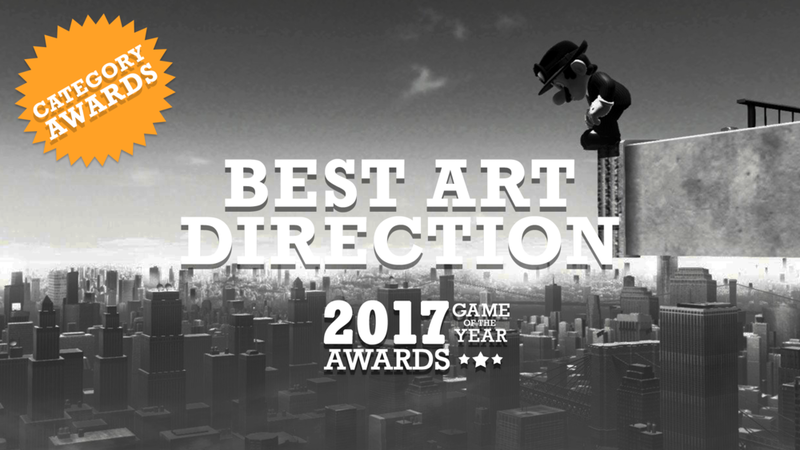 This year we've brought back our category awards to recognize achievements in specific areas of game development. There are 10 awards in all, with two new ones being awarded every day this week. Keep checking back for more winners! Don't miss out on any of our Game of the Year coverage. Check out our full schedule here, and get instant updates on Instagram, Facebook, and Twitter, or subscribe to our RSS feed. Mario and Mickey Mouse share more than a few strands of corporate DNA. Both are icons of the modern era whose timeless images have largely remained unchanged for decades. There are simple truths about their designs: Mario wears a red hat and has a mustache; Mickey wears red overalls and has big ears. Both apparently shop at the same glove store. Branding is prudent business. Consistency encourages legacy. Legacy creates household names. Household names become merchandise. Merchandise is sold to eager parents introducing kids to childhood favorites. It continues on, and on, and on, in perpetuity. Disney learned this almost a century ago. Nintendo followed in its footsteps. Almost any modern kid can describe Mario’s trademarked features, and Mario long ago surpassed Mickey in overall public familiarity. Even so, consistency entrapped recent Mario games. Despite all the go-karts and golf courses, each of Mario’s wacky side-gigs looked the same, like they happened on the same city block in the Mushroom Kingdom. Nintendo’s house-style encouraged warm familiarity, but did nothing to push the franchise’s aesthetics forward. Mario played it safe. Thankfully, Super Mario Odyssey upends nearly every one of the franchise’s visual language conventions. Art Director Rikuto Yoshida let his team’s imagination run wild, and made the best Mario in years because of it. Mario still has his mustache, but this time you don’t even need to wear those blue overalls—or any shirt at all. His outfits, now customizable, are as varied as the circus-like whimsy of the levels in Odyssey. Odyssey is a bombastic, punk, street-style art show. Instead of being designed with the usual visual stuffiness of a paint-by-numbers Mario game, Odyssey sets no such limitations. Mario’s titular sojourn takes him to self-contained, themed playgrounds that go beyond the typical snow and lava descriptors. It’s better for its fiesta skeletons and photo-realistic Tyrannosaurus Rex. In any other game, swapping palettes from the calm, sunset beaches of the Seaside Kingdom to the dark, dreary downpour of the Ruined Kingdom would feel disjointed. But because of the inherent silliness and joy in possessing a variety of monsters, the disconnect is bridged. No world truly disappoints. Even the weakest links help to form an incredible chain. Bowser’s Castle is a standout level, bringing an unexpected, exaggerated samurai flair to what’s always been a straight-laced and familiar land of fire flowers, toadstools, and coins. For what feels like the first time, a Mario game can be looked at with fresh eyes. Super Mario Odyssey is presented as a kaleidoscope of limitless creativity.